This beautiful oak tool chest is perfect for organizing just about any tools that need to be kept handy. Quantity: This item is currently out of stock! GERSTNER INTERNATIONAL Machinist Oak Tool Chest GI-T24 Original Gerstner International tool box! This beautifully crafted red oak hardwood case comes with a plywood inner core, yet is strong enough to last a lifetime. The quality with which is it crafted is noticeable even from a distance and compliments will not be at a premium when it comes to this particular storage piece. People will instead be asking where they can get one, too. This is Gerstner International's new model #GI-T24 which replaces the #GI-533 (which replaced the #GI-532.) Reconfigured with better quality and a lower price by Gerstner! Gerstner and us at Madison are very excited about this new item! Same outside dimensions as the old GI-532, with the major change being in the different drawer configuration. 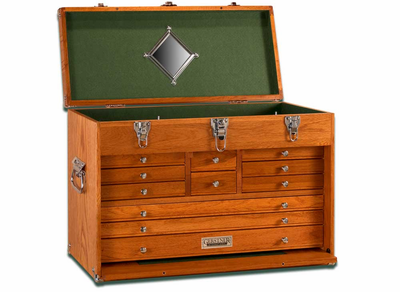 Obviously, the purpose of the amazing oak chest is to store the tools of those used by people such as artists, machinists, or other hobbyists. Of course, just about anything of particular value can be stored in a chest such as this. It is also the perfect place to store and organize those precious keepsakes that bring forth pleasant memories when viewed. The GERSTNER INTERNATIONAL Machinist Oak Tool Chest GI-T24 weighs in at just 28 lbs and comes with a key for locking. It even comes with 10 separate drawers for organizing contents. These drawers vary in size so that a variety of items can be easily stored within them. Overall Dimensions:	24" x	10"	17"
Top compartment:	23" x	8-7/8" x	4"
6 Drawers:	7-5/8" x	7" x	1"
2 Drawer:	3-5/8" x	7" x	1-3/4"
2 Drawer:	22" x	7" x	1"
1 Drawer:	22" X	7" x	1-3/4"
This chest is a must have to store all of your precious hobby belongings or whatever else deemed precious enough to store in an organized lockable container. The former GERSTNER INTERNATIONAL Machinist Oak Tool Chest GI-533 has been replaced by this GI-T24 chest. Color may be slightly different � still a golden colored red oak. Quality is much better and best of all the pricing has changed (lower). Gerstner has worked hard on this Gerstner International line of products - Imported, (as opposed to the traditional Gerstner USA flagship line,) to come up with some economies and help their factory in China set up in order to make sure these items are meeting the standards they have set for the Gerstner International brand. 4.7 out of 5, Based on 29 Reviews. This is a great deal. Both the top T24 and base M24 arrived in perfect condition. While it may not be as intricate or precise as the $1800 American boxes, for the price you will not find anything better. My only complaint is it doesn't come with a cover and they don't make one for this exact model. Just received my box,so far so good. I diddnt expect it to compare to a real h Gerstner,and it really doesn't. But for the money it seems pretty well made. Its headed for the shop tomorrow morning,as long as nothing falls apart i can say i am satisfied. And would recommend. It arrived undamaged,was a little disappointed that there was really no communication on shipping. It did arrive in about a week. Bought two chests at this price plus a base for one of them. Love them! We make jewelry and couldn't find a solution that we liked for storing pieces until we came across these! Recommend for anyone! This is a nice chest for the money, and as previous reviewers wrote, I had to make some adjustments, though very minor. I was surprised to find the "MADE IN CHINA" label on it as I thought these were made in Ohio; I guess that's why they are made with a little less "real wood" -- and what the International means on the label. I would still recommend this chest though as it is extremely well built for the price tag on it. This chest is quite impressive right out of the box. As a woodworker I found several minor imperfections that I wanted to correct. All the metal hardware was flawless; however, some of the phillips flat screw heads (M4x12) were stripped. The large panels are oak veneer; some were uneven and rough to the touch. A light sanding and a recoat with gloss spray lacquer solved this problem. Some of the interior dividers were not completely stained. Shellac tinted with a raw sienna pigment is an almost perfect color match. The drawer bottoms are hardboard covered with green felt on the top; the hardboard used on my chest was a dark maroon on the underside which seemed like an odd choice. Fortunately, the undersides of the drawers are not seen. Finally, the 22 drawer runners are plasitic; several of them needed to be filed to remove mold marks to obtain a flat and smooth surface. Overall, this chest is a great value and can be improved with a little hand detailing. This Tool Chest was bought for a gift. It came in quick and was package very well. No blemishes. Looks very nice. This box has been in hand for a few weeks now and pleases me just fine. I knew what it would likely be before it arrived so there were no surprises upon un-boxing. Arrived promptly and was well protected from handling (abuse) while in transit. The only real hint of disappointment is it's need (my preference really) for a coat or two of good spar varnish. Well, that and the fact that the color does not begin to match any of the bases I have available. I've not yet loaded it because in the coming weeks I'll be disassembling it to do the finish work and in doing so those odd flaws will disappear. A very solid purchase if one puts things in perspective. Strongly recommended !! In-laws loved the chest;it was a great gift choice. Excellent service and fast shipping. Thank you! My experience with Madison Art Shop for this purchase was outstanding. Upon unboxing the chest it was exactly what I was expecting and the construction was very good. I did discover that the bottom drawer was split and sent photos to M A S who then contacted Gerstner. It was determined that it was shipping related. From placing the order getting a replacement drawer shipped to me was less than 10 days. Awesome customer service by both Gerstner and Madison Art Shop. Chest is fantastic and looks great, I could not be more pleased with this purchase! This chest is what I expected for the price. Quality is good, but not outstanding. The Gerstner International products do not stand up to the original Gerstner standards. But then again, the price of a real Gerstner chest was out of my reach. The only real flaw so far is the veneer on the bottom of the chest is starting peel away. I can fix this with a little glue. The front closing door does not fit snugly as I would expect. I will write another review in a year after the chest components have had time to cure in the indoor environment that I am keeping it. This was a ...gift for my father-in-law. He absolutely loved it. Excellent quality. Great shopping experience. Highly recommend. We got two of these. One for me and one for my husband. They are wonderful. Very well made and extremely good looking in our workspaces. Thanks much Madison Art Supply!!!! The tool chest I purchased was easy to order had fast shipping and was in perfect condition upon delivery. I was completely satisfied with the workmanship. I highly recommend using Madison Art Supply and will order from them again in the future. Madison Art was excellent to trade with. They are very prompt and no questions asked. Great online service. I purchased the Gerstner 532 Tool Chest. Excellent product and very happy with it. I had considered the 530 but very happy to have chosen the slightly larger version, the 532. I would be very inclined to deal with Madison Art again. Prices are excellent (for the chest anyway). 5 Stars recommendation for those contemplating a purchase from Madison Art. Chest is good Chinese quality. All the utility of US made version without solid woods and the high price. Fast shipping in Gerstner box and well packaged. Wide drawers need to be opened with both knobs and drawers have no stops. 5 stars for getting what you pay for, not a rating against US equivalent. I'm a metalsmith and use this box in my studio. All the drawers are perfect for my tools. Madison Art has the best prices and the box arrived well packed and in terrific condition. Loved it so much I had to get the base as well. In summary, this is a very nice chest. I searched for something like this for weeks online and as much as I would have loved to get the USA made tool chest, I just couldn't justify the price. The primary use of this chest was for my home office. My desk was a mess with small stuff and my desk does not have drawers. So, after searching for a desk organizer, I came across wooden tool chests. So, after reading reviews, checking Amazon.com, I narrowed it down to this unit. For the price, this was a great purchase and I love the utility because of the number of drawers. Now my desk is uncluttered with small stuff. The quality of the unit (initial impression) looks good. Only minor complaint - if I can even call it that - is that the drawer can use a bit of something to make it slide smoother. But again, it's a very minor issue. This is by far the best organizer that I could have purchased. I may get the base unit just to have more drawers. The tool chest I purchased was easy to order, had fast shipping and was in perfect condition upon delivery. I was completely satisfied with the workmanship. I highly recommend using Madison Art Supply and will order from them again in the future. This chest arrived quickly and well packed. It was exactly as I expected and worth the price. It is great for holding the small tools I use in my hobby. Madison Art's web site is well designed and easy to use. This is a very good piece of wood work. The drawers could be a little tighter. All in all it will work very well for my daughter's art supplies. Madison Art shop did a very good job of shipping. Received my item in 5 days after being ordered on a Friday. Very good company to do buisness with. Nice Chest, I use the chest to keep my reloading dies and tools organized. Very useful at the reloading bench. Ordering was simple and shipping was very quick. Very quick shipping - Thank you to Madison Art Shop. The chest and base by Gerstner International are no match for the real deal Gerstner made in the USA (drawer bottoms are cheap and stapled on), but it's pretty decent for a Chinese made tool box. I got this tool chest for my jewelry collection and it is just perfect. It's easy to find the piece I'm looking for and the chest looks good in my bedroom. Very well made. I bought a cheaper one(cheaply made!) and and am exchanging it. will use it for my beading supplies in a less noticable place in my home. I also got the GI-310 jewelry chest and it is beautiful and just right for on top of my dresser. Very well made and attractive storage chests. I bought the machinist chest and base. Both were very well packaged and arrived in perfect condition. Delivery was very prompt. I bought this chest set to store a very large collection of both fine antique and vintage costume jewelry. The value of the costume jewelry is dependent on its condition and to be kept in mint, like new condition, the jewelry requires storage away from dust and sunlight. This chest set was the perfect solution. I may have to purchase another for my vanity to store my personal jewelry collection. This set of chests was the perfect solution to my jewelry storage needs. They are very handsome and well-made with nice interiors. I do like the fact that the drawers are removable so I can see the inside of the whole drawer and utilize every corner of space. Also I received the chests in perfect condition within 3 days of placing my order. Very fast service. Thank you. I use this chest for keeping my fly-tying materials. It is well made, very nice looking and has ample storage. I am very satisfied with this purchase.